Ariana Grande lead emotional One Love show for Manchester. Ariana Grande performed with her supporting musicians at a benefit concert for the families of the victims of the May 22 terror attack. Here are the best moments, photos, videos, and highlights of the concert. The next generation of this world has spoken. We are united. We are not afraid. And we do not politicize, we take actions. Ariana Grande returned to sing in Manchester less than two weeks after horrific suicide bomb attack – May 22 – took the innocent lives of 22 people and injuring 116 others. The London attacks on Saturday did not deter her and she played with “greater purpose”, her manager said before the show. Sunday’s concert raised money for victims of a suicide bombing that struck at the end of singer Ariana Grande’s last show nearly two weeks ago. The pop singer visited young fans injured in the attack at the Royal Manchester Children’s Hospital on Friday. Victims and survivors were commemorated “with courage, bravery and defiance in the face of fear”. 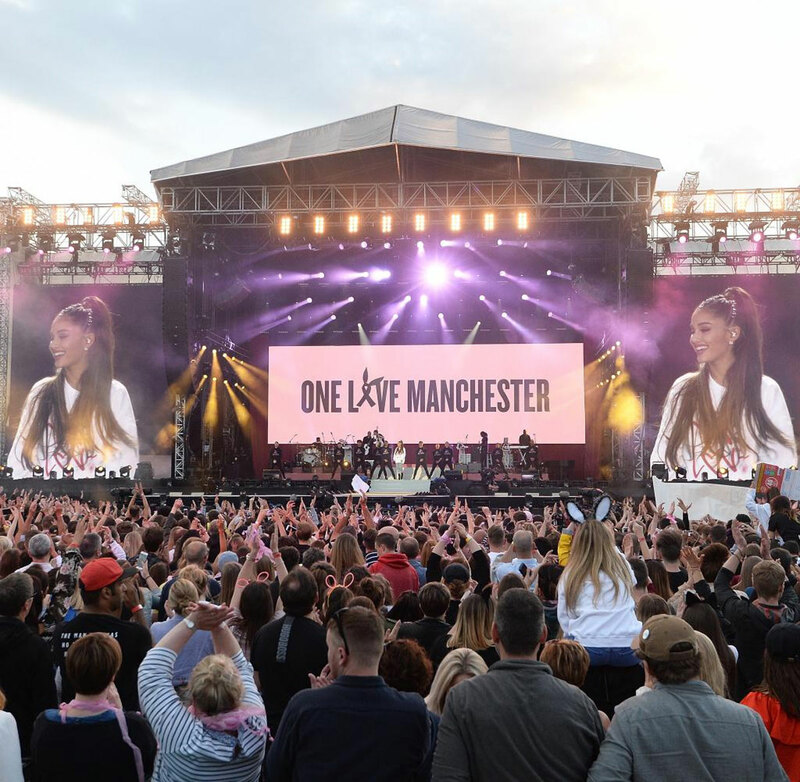 One Love Manchester was pulled together in scarcely a week and drew some of the biggest names in pop playing for free. Performances included Justin Bieber, Coldplay, Katy Perry, Miley Cyrus, Pharrell Williams, Usher, the Black Eyed Peas, Robbie Williams, Niall Horan and Little Mix. The concert came the day after attackers targeted the heart of London, killing seven people. Authorities have said the attack started with a van plowing into pedestrians and then involved three men using large knives to attack people in bars and restaurants at a nearby market. “We must not be afraid and in tribute to all those affected here and around the world,” Braun said in a statement. The show was broadcast across the globe and proceeds went to an emergency fund set up by the city of Manchester and the British Red Cross. The concert also was broadcast on more than 130 iHeartRadio stations, and MTV livestreamed the event on the website www.onelovemanchester.mtv.com. Stevie Wonder’s statement was broadcasted on a screen. For its simplicity and sincerity, Wonder’s message has been hailed positively, in moments that political leaders in our country hasn’t voiced their powerful voices strong enough behind the recent attacks in UK. The Grammy-award winner’s message is in total juxtaposition to President Trump’s who in the early Sunday he took to twitter to blast the Mayor of London after another recent terror attack. British singer Marcus Mumford held a moment of silence before performing at the Manchester benefit concert Sunday. Marcus Mumford said: “Our thoughts are with everyone that has been affected by this, but right now we want to stand strong, look at the sky, and sing loud and proud.” It was one of the most powerful speeches made during ‘The One Love Manchester’ Concert. Music’s biggest stars unite to send messages of support to those affected by the Manchester attacks. As the stars like Ariana Grande and Justin Bieber honored the victims of the attacks in Manchester and London, a policeman was seen holding hands with concert goers and skipping around in a circle. Ariana joined members of the choir of Parrs Wood High School, located in a Manchester suburb, to sing “You Are My Everything.” It was a particularly sweet moment and many in the crowd were seen in tears. The Black Eyed Peas (Fergie was not present. ), delivered a rare performance of their 2003 hit “Where Is the Love?” alongside Ariana Grande. Liam Gallagher surprised the audience at the “One Love Manchester” benefit concert and besides performing a handful of Oasis songs he also sang his new solo single, “Wall of Glass.” Then Gallagher sang “Rock n’ Roll Star,” and later Coldplay joined him to sing “Live Forever” from Oasis’ 1994 album Definitely Maybe. Justin Bieber turned out to be the biggest rock star and unifier at Ariana Grande’s One Love Manchester concert. He went with nothing more than a guitar and his voice, and that was incredibly effective. Justin also did a prayer for the fallen victims of Manchester, and even asked the crowd to put both hands up in the air and to repeat after him in honoring those victims. After singing Love Yourself and Cold Water, Bieber said: “I’m not going to let go of hope. I’m not going to let go of love. I’m not going to let go of God. He added: “God is good in the midst of the darkness, God is good in the midst of the evil, God is in the midst no matter what is happening in the world. During most of the One Love Manchester benefit concert Ariana Grande was seen emotional. At one moment she revealed how emotional meeting with mum of Olivia — one of the youngsters who lost her life in the bombing at her concert. — changed One Love Manchester. The pop star was on stage at the gig when she began talking about Olivia Campbell-Hardy. Tears filled her eyes as she addressed the crowd and thanked everyone who went along. Then, speaking about a meeting with Olivia’s mum, she was filled with emotion as she revealed that she changed her set after speaking to Olivia’s mum about what her daughter would have wanted to hear at the concert. During the One Love Manchester benefit concert, Ariana Grande was visibly emotional, and appeared to tear up as she finished the songs. The singer thanked the crowd multiple times during the concert. “The kind of love and unity that you’re displaying is the medicine the world really needs right now,” said Ariana a after one of her songs. The benefit concert held in the wake of the Manchester attack turned into a night of unity, healing and joy for 50,000 music fans. Stars such as Robbie Williams, Niall Horan, Pharrell Williams, Take That and Katy Perry, Justin Bieber performed at the concert, infusing messages of strength and positivity throughout the night. Despite the circumstances, a celebratory atmosphere prevailed as Grande herself returned to the stage. Grande wore a One Love Manchester sweatshirt – and many of the fans wore shirts bearing similar messages, or face paint saying “I heart MCR”, or #WeStandTogether stickers. At the end of the show, Ariana Grande was joined on stage by the night’s other stars to perform the song One Last Time before finishing with a poignant solo rendition of Somewhere Over the Rainbow. In a word, the One Love Manchester concert was “amazing” and it was emotional at the same time. Sunday’s Ariana Grande’s One Love Manchester benefit concert was amazing and an emotional tribute to the victims of the horrific attack in Manchester.